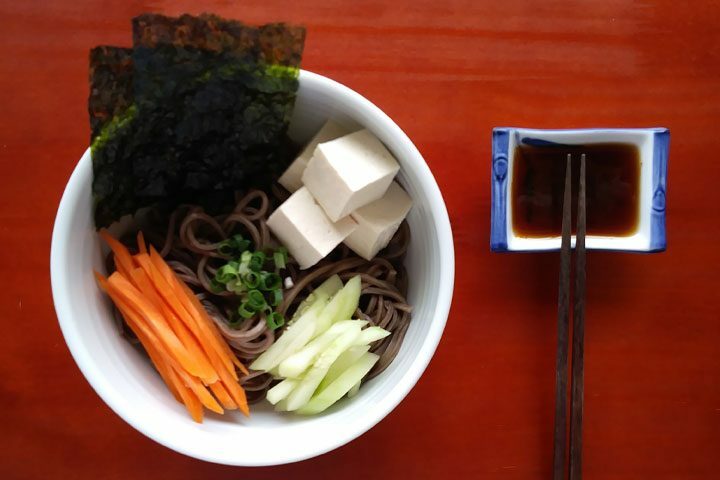 What are soba noodles (buckwheat noodles)? A healthy, easy-to-make cold Japanese soba noodle recipe using buckwheat noodles, lots of fresh ingredients, and a simple Asian homemade dressing. This light vegetarian- and vegan-friendly dish makes for a perfect lunch. Refreshing! Soba noodles are a Japanese type of noodle that is made primarily of buckwheat flour, which happens to be a gluten-free ingredient (As always, however, it is important that you carefully read the package because some versions do incorporate other types of flour which may include gluten. If you want to make sure you’ve got the right kind, here’s one that’s sans gluten). Buckwheat flour is a excellent source of magnesium and also contains other components that are good for your health, such as fiber, protein, and antioxidants. The noodles are brown, fairly thin, square-shaped, and firm. The most common way to eat soba noodles is to serve them chilled as a part of an Asian noodle salad that incorporates other ingredients, all topped with an Asian sauce or dressing. It is less common, but not rare, to eat soba noodles in hot dishes, like in a stir-fry or noodle/soup entree. Don’t mistake soba noodles for somen noodles, which is another Japanese noodle that is often served in a similar fashion: as a cold starch with other ingredients, including a sauce or dressing. Somen noodles are also very thin, but are white and made with wheat flour. Because of how thin they are, dried soba noodles tend to cook pretty quickly. The beginning part of the process is similar to how you would cook most types of noodles: boil a pot of water, then throw the dried noodles in for the specified duration on the package. For soba noodles, you don’t need to salt the water because most versions often already have relatively high salt content. The most important part of preparing the soba noodles comes after you are done boiling it. Before dumping your noodles out, taste test one of them to see if it has reach the al dente stage, where it is cooked but not mushy yet. If you’ve reached that desired firmness, dump all the noodles out into a colander to drain the hot water out, then immediately run the noodles under cold running water so that you can stop the cooking process and also wash off any excess starch. Getting the starch off is actually quite important to prevent your noodles from getting mushy and clumping. You really want to get in there and stick your hands right in the noodles, working through them to ensure the noodles are thoroughly washed under the cold water. Some people try to get around having to let their noodles sit in the fridge to cool by using really cold water that’s just shy of ice-water temperature to wash and dunk their noodles in. 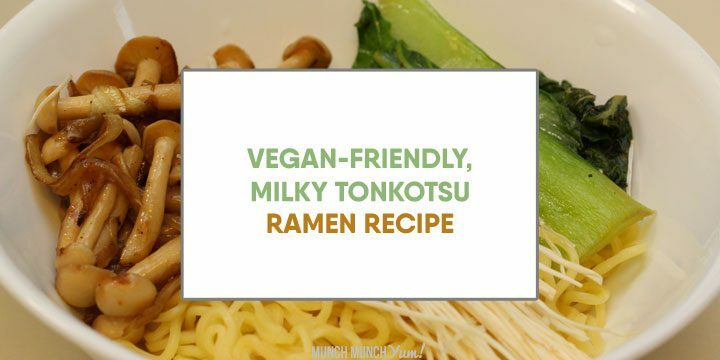 However, our preference is to go ahead and let the noodles sit in the fridge for a bit, in a strainer with a plate or bowl to catch the excess water. 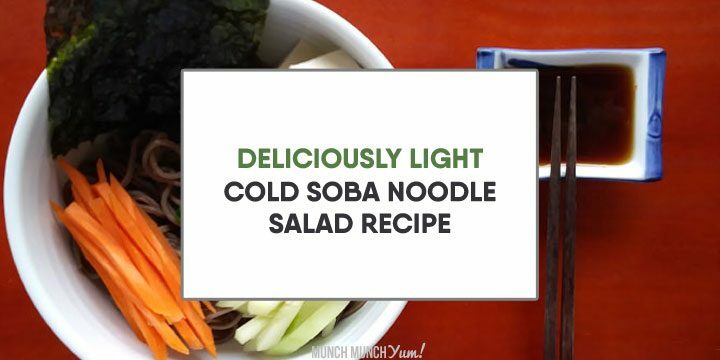 The cold air and extra time allows your noodles to dry out better, so that there is no watery puddle at the bottom of your soba noodle salad dish. If there was such a thing as a Best All-Around Vegetarian Recipe award, this soba noodle salad would be definitely be a front-runner. First and foremost, it’s super yummy (like everything else on our site!). 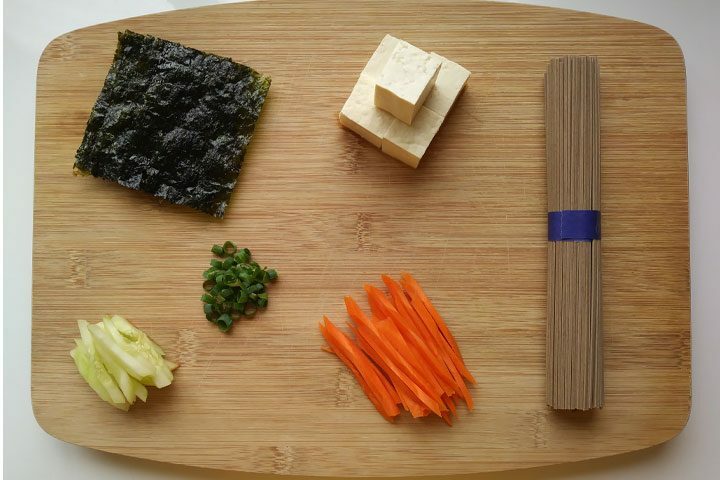 Second, considering that not everyone has ninja-level kitchen skills, we love how easy it is to make. The only cooking needed is to boil the noodles, and then there are only a few ingredients to prep. 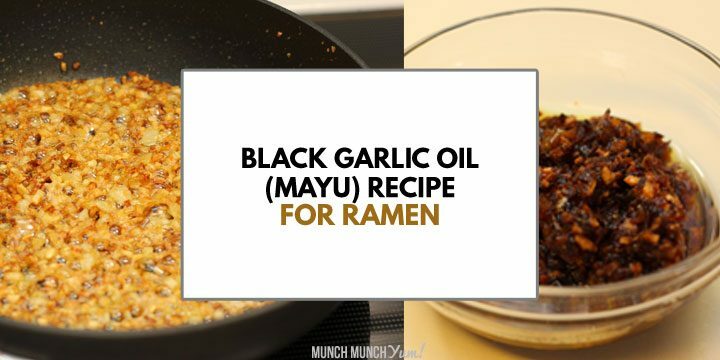 And because of how little cooking there is, you can make this dish super quickly, which is great if you don’t have a lot of time to devote to preparing the meal. The salad also features lots of fresh ingredients, making it very healthy for you. But because the salad doesn’t feature leafy greens, for those who don’t normally like salad, it doesn’t feel like you are forcing yourself to eat something “healthy.” And, everything is intended to be chilled, so you can pre-portion your leftovers into meal prep containers and just grab-and-go the next day without having to reheat anything! Given all these pros, we highly recommend this recipe who wants to try their hand at cooking for the first time. It gives you an opportunity to practice your knife skills when you are prepping the ingredients, and you can even try your hand at plating when you arrange everything in the bowl. 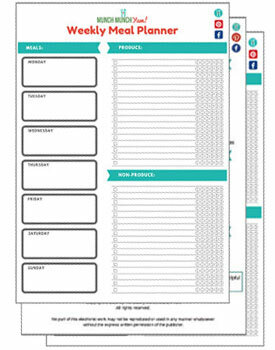 The ingredients’ wide variety of colors gives you the chance to create a beautiful final result! Step 1. Cook soba (buckwheat) noodles according to package directions, then wash thoroughly under cold water to help cool the noodles quickly. Step 2. Put noodles and other prepped non-dressing ingredients into refrigerator at least 20 minutes to chill. Step 3. To make dressing, combine the dressing ingredients into a mason jar and shake to mix, or whisk together in a bowl. Step 4. Serve noodles chilled with other ingredients artfully arranged and drizzled with dressing. 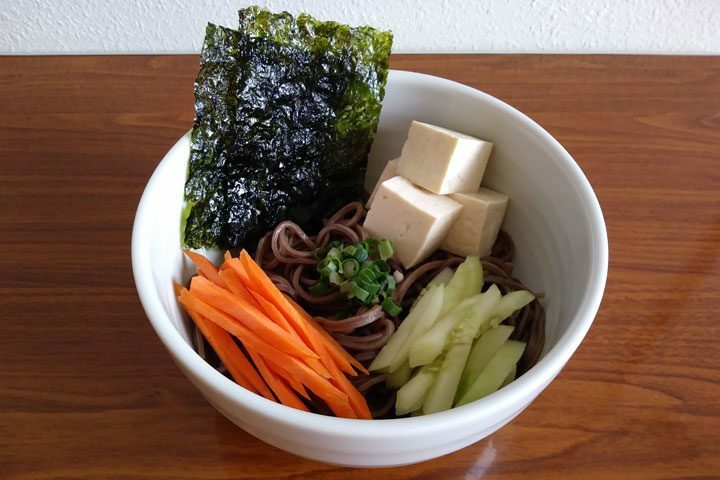 A healthy, easy-to-make cold Japanese soba noodle recipe using buckwheat noodles, lots of fresh ingredients, and a simple Asian homemade dressing. This light vegetarian and vegan-friendly dish makes for a perfect lunch. Cook buckwheat noodles according to package directions, then wash thoroughly under cold water to help cool the noodles quickly. Put noodles and other prepped non-dressing ingredients into refrigerator at least 20 minutes to chill. To make dressing, combine the dressing ingredients into a mason jar and shake to mix, or whisk together in a bowl. Serve noodles chilled with other ingredients artfully arranged and drizzled with dressing. Like with any salad dish, your ability to mix and match ingredients is limited only by your imagination! Some will fit the Japanese flavor profile better than others, though, so here are some of our suggestions for additional or alternate swaps you can try:Snap peas or snow peas, bell peppers, corn, edamame (soy beans), sesame seeds, finely minced garlic (for dressing), wasabi, pickled ginger, faux chicken. 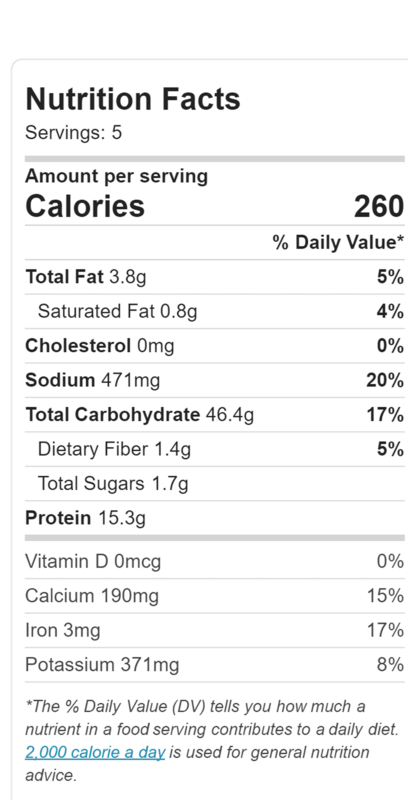 Nutrition facts displayed for soba noodle salad ingredients only. Dressing is an additional 86 calories.